Bovine viral diarrhoea virus (BVDV) is a pestivirus that affects members of the order Artiodactyla, including members of the subfamily Bovinae. Little is known about the seroprevalence of BVDV in southern Africa, especially the prevalence in wild ruminant populations such as kudu (Tragelaphus strepsiceros). A handful of random surveys suggested that seroprevalence ranged between 6% and 70% in southern African wild ruminants. The present study aimed to determine the seroprevalence of BVDV amongst kudu and eland (Taurotragus oryx) from Namibia and South Africa. A BVDV-specific enzyme-linked immunosorbent assay was performed on 50 serum samples from kudu and eland from South Africa and Namibia. The seroprevalence of BVDV in South African kudu was 71%, identical to that in Namibian kudu. The seroprevalence in Namibian eland was 40%. The kudu and cattle farming (free ranging) regions in Namibia predominantly overlap in the central regions, ensuring ample opportunity for cross-species transmission of BVDV. It is therefore important to determine the true prevalence of BVDV in southern Africa in both domesticated and wild animals. In addition, a potential link between BVDV incidence and a devastating rabies epidemic in Namibian kudu was proposed and such a notion could be supported or discredited by comparative prevalence data. Bovine viral diarrhoea virus (BVDV) belongs to the genus Pestivirus, family Flaviviridae (International Committee for the Taxonomy of Viruses 2011). IgG antibodies against BVDV infection are produced within 2-3 weeks post infection and the animal remains immune to future challenges of the same strain for the rest of its life (Brownlie et al. 1987). A limited number of serological studies of BVDV have been performed in sub-Saharan Africa and the majority of these studies have focused on BVDV in domestic cattle. Such studies performed in South Africa have shown a range of 51% - 77% seropositivity in different regions of the country (Theodoridis, Boshoff & Botha 1973). In other southern African countries, seropositivity was found to range from 6% to 70%, with notable upward and downward trends depending on the years sampled (Anderson & Rowe 1998; Depner, Hübschle & Liess 1991; Hamblin & Hedger 1979; Hunter & Carmichael 1975; Soiné, Uatanaua & Depner 1992; Vilcek et al. 2000). This study aimed to add knowledge regarding BVDV incidence in southern African wild bovids by determining the prevalence of BVDV in Namibian and South African kudu (Tragelaphus strepsiceros) and eland (Taurotragus oryx), with a specific focus on a sizeable Namibian kudu sample cohort. Kudu are commercially farmed in Namibia and are of significant economic importance. In addition, until 2012 Namibian kudu suffered a 10 year long rabies epidemic, which was suggested to be linked to an enhanced disease susceptibility induced by BVDV (Brownlie et al. 1987). The data presented in this study show a high seroprevalence of BVDV in kudu, in populations from both Namibia and South Africa. Whole blood samples were obtained from kudu from a 200 km2 area near Lephalale, Limpopo, South Africa, and from kudu and eland in Namibia from a range of game farms (Table 1). The whole blood was stored on ice and transported to the University of Pretoria where the serum was separated by centrifuging at 10 000 g for 30 min and stored at -20 °C until use. An enzyme-linked immunosorbent assay (ELISA) was performed according to the protocol described elsewhere (Beaudeau et al. 2001), with slight modifications. Serum was diluted to a 1:5 dilution ratio in a solution of phosphate-buffered saline Tween-20 and 2% skim milk powder (Oxoid, Canada). Antigen from the BVDV Singer strain (GenBank accession number: L12455.1) was used and ABTS (2,2'-azino-di-[3-ethyl-benzthiazoline-6-sulfonate]) substrate was used. The optical density (OD) was read with an EL800 plate reader (Biotek, South Africa) at a wavelength of 450 nm. Non-specific ELISA activity was controlled by including a microtitre well without antigen for each serum sample. A sample was considered positive when its OD was three times that of the negative control. 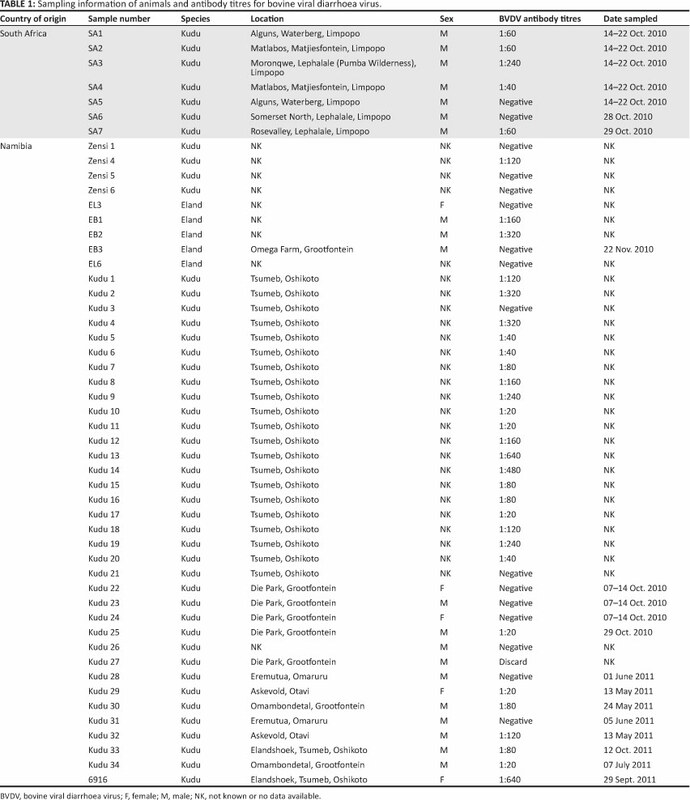 In total, 50 serum samples (Namibian kudu: 38; South African kudu: 7; Namibian eland: 5) were tested for BVDV (Table 1). 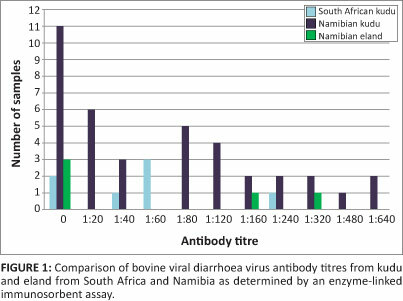 Figure 1 represents the antibody titres determined by the ELISA for BVDV in South Africa and Namibia in both kudu and eland. In total, 27 of the 38 (71%) Namibian kudu and 5 of the 7 (71%) South African kudu were seropositive. Only 2 of the 5 (40%) eland were seropositive. The game farming industry is important for the Namibian economy and encourages tourism through hunting safaris and trophy hunting expeditions. Kudu comprise a large portion of the game farming industry in Namibia and also come into contact with several domestic species. Thus the prevalence of BVDV in kudu may pose a threat to the cattle farming industry in Namibia and neighbouring countries. BVDV serology results showed a high seropositivity (68%) amongst all samples (kudu and eland). In this study, BVDV seropositivity of kudu in Namibia was determined to be 71% (27/38), which was similar to previous studies in Namibia (Depner et al. 1991; Soiné et al. 1992). For the South African samples, a seroprevalence of 71% (5/7) was observed. As no other study regarding the seroprevalence of BVDV in kudu in South Africa has been performed, these results can be compared only with those from other countries in the southern African region, such as Namibia (66%) (Depner et al 1991; Soiné et al. 1992) and Botswana (40% - 70%) (Hunter & Carmichael 1975). This present study reveals that BVDV is prevalent throughout Namibia and that this virus has been circulating amongst wild ruminants in Namibia for more than two decades. The unique situation of endemic kudu rabies, exclusive to Namibian kudu, has also prevailed for more than three decades and is still ongoing (Scott, Hassel & Nel 2012; Scott et al. 2013). Despite the overlapping time frames and previous speculation based on the effect of BVDV on the immune competency of animals (Brownlie et al. 1987), the two disease complexes do not appear to be linked. This study has demonstrated the exposure of wild ruminants to BVDV in southern Africa. The prevalence of antibodies in kudu was shown to be 71% in Namibia. Our data show that the BVDV prevalence in kudu populations outside Namibia (e.g. South Africa) is equally high, although based on a limited sample set, and provides no significant support for a correlation with kudu rabies. Future in-depthepidemiological analyses are required to determine the origin of this cycle of BVDV in the wild ruminant populations and the epidemiological links with domestic species. It is important to determine the true prevalence of BVDV in southern Africa, in both domesticated and wild animals, to elucidate the threat that it poses to livestock and game in Namibia. We would like to thank the University of Pretoria and the National Research Foundation for funding. We would also like to thank all the participating farmers in Namibia, Cruiser Safaris and Thomas Ochsenbein for obtaining blood samples. Publication of this article was sponsored by the Wildlife Group (http://www.vets4wildlife.co.za) of the South African Veterinary Association. L.N. (University of Pretoria) was the project leader. L.N. and W.M. (University of Pretoria) were responsible for the experimental design. T.P.S. (University of Pretoria) and E.S. (Design Biologix) performed the experimental procedures. T.P.S. and L.N. were responsible for the acquisition of samples. All authors contributed to the writing of the manuscript.